Kris Commons’ third season as a Celtic player saw the mercurial midfielder satisfy his potential to a large extent. In almost every sense, this was a successful season for Commons who played a pivotal and creative role for the Scottish Champions. Commons made a storming start to the 2012-13 season. A brilliantly executed half volley away to Helsingborg in the Champions League 4th qualifying round tie, set up an excellent away victory in the first leg and went a long way to ensuring progress to the coveted group stages. In the League, Commons secured victory in the opening league game of the season against Aberdeen (albeit with a LOT of help from Jamie Langfield) while also striking an injury time equalizer against Ross County in our first Premier League fixture in Dingwall. What Commons did at this point was help keep Celtic’s domestic challenge on track in the face of significant distractions in the form of European progression, specifically making the Champions League group stages. A hat-trick against St.Johnstone in the League Cup were Commons’ only goals (domestic or otherwise) until pitching in with an important contribution in December with a goal went a long way to defining Celtic’s season. A penalty in the 81st minute against Spartak Moscow ensured Celtic’s last 16 qualification in the Champions League. Celtic had qualified for the latter stages of European football’s premier club competition in the face of quite formidable barriers. Kris Commons had been at the forefront of this progress and the penalty he successfully struck against the Russians was just reward for his sterling performances. Commons then went on a rich vein of scoring form in the New Year. All of Commons’ domestic goals also came in 2013, including two goals in the 4-3 Scottish cup semi final victory over Dundee United, a feat that set up the possibility of a domestic double for the first time since 2007. The end of the season saw Commons place himself as the club’s’ second highest top scorer in the SPL for Celtic behind Gary Hooper (19) with 11 goals – Commons also had the most SPL assists for Celtic with 11 assists[i]. These levels of consistency were achieved through having the 6th highest number of appearances in all competitions for Celtic with 46 appearances respectively. Commons’ overall stats for the season – 19 goals, 17 assists[ii] (2 goals in 12 appearances in the Champions League – also took part in all of Celtic’s group stage games and last 16 ties) – look, and are, impressive. He proved himself to be one of Celtic’s most impressive and consistent performers in a highly satisfying campaign. Toward the end of the season, however, Commons also made the significant decision to end his Scotland career. According to the man himself: “I’ve been thinking about the Scotland thing for weeks and Neil Lennon knew my feelings on the matter. The doubts began when I was in the squad for the Serbia game. My boy was in hospital and I was in a hotel. It really sunk in then that my missus Lisa was on her own in Glasgow so I had to leave the squad as I’m a dad and I need to put my family first. I don’t want to take any risks. I’ve got three kids under three years old and I miss them enough just playing for Celtic…This is an important time for me as a father to be around my kids as they are growing up. I think it’s the best time to be with them although it’s not all about my kids, it’s about Lisa as well. She’s with the kids Monday to Friday while I’m away Friday nights and, in Europe, sometimes Mondays, Tuesdays and Wednesdays as well”[iii]. Despite the clear emotional criteria that Commons had made his decision on, it appeared that Scotland top brass, both past and present, disagreed with his decision. Former Scotland manager Craig Brown described the situation as “very disappointing” and adding “he’s another manager’s player, so I don’t want to be critical of Commons, but what I hear this morning is that he’s in Las Vegas [at the Celtic first team end of season getaway]. If you’re asking my opinion, that doesn’t send out a good, enthusiastic message. If a player said he had family reasons and was then in Las Vegas then, no matter who, I would say that’s terrible. I’m disappointed. You want players who are committed to the cause, don’t you?” [iv]. 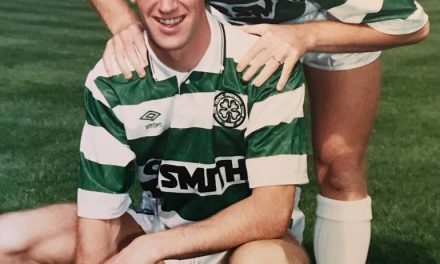 Commons’ decision to quit Scotland had also brought condemnation from SFA performance director Mark Wotte, who tweeted: “Retiring at 29, after 10 caps, honestly, still puzzles me! Where does pride, desire and ambition come in this picture?”[v]. However, current and former Celtic captains also came out in defence of Commons’ decision. Tom Boyd categorically stated his support for Commons while also pointing out that other players who had made similar moves in the past had maybe not done so honourably: “That has happened through the years. Better players than Kris Commons have pulled out, for worse reasons. Kris has decided to retire and that is his choice. He has got a young family and he is now wanting to spend more time with his family and you can understand that. Yes, you would rather that he was on the football field but that is his reason. Down the years there have been plenty of call-offs from Scotland teams for worse reasons than someone saying that he is retiring”[vi]. The current Celtic captain Scott Brown also stepped up to defend his team-mate from criticism, pointing out in explicit terms the travel demands put on professional football players plying their trade at the highest level: “Every man to his own…We stay away in a lot of hotels on European trips and it is hard to see you family, so I totally understand where Kris is coming from. We are also in hotels the night before every domestic game and you can be away from the family three times a week. So you could be having just a night or two in your own house a week, then there are the double-headers with Scotland when you can be away for ten days at a time. So it is hard”[vii]. It was notable however that Commons decision certainly did not provoke any significant levels of backlash from Scotland supporters, either online or in the remaining Celtic fixtures for that season. In reality, and despite attempts in some quarters to paint Commons as some sort of treasonable renegade, the reasons for the player’s’ decision were accepted in good faith by most Celtic and Scotland supporters. As it transpired, Commons ended the season in style and success. He played a quietly effective role in Celtic’s Scottish Cup Final victory over Hibs, sealing a pleasing finale and end to the season. At the end of the Scottish Cup Final Commons made a kind gesture to some young Celtic supporters: “The Celtic icon gave his boots to young fans at the end and said: “I’ve thrown away quite a bit of stuff recently but I think it’s nice that kids get the best stuff. These kids pay to come and see us and we appreciate that so it’s nice to give them something to remember us by”[viii]. This sort of compassion and generosity, combined with consistently high-level performances, has seen Kris cement his reputation among the Celtic support. Hopefully Kris will to enjoy his football, and produce high quality performances as a result, at Celtic Park for some time to come.